Since its introduction in the 1977 film "Star Wars," the Death Star has remained one of science fiction's most iconic figures. The image of Alderaan's destruction at the hands of the Death Star's superlaser is burned into the memory of millions of fans. Scientists and laser experts have maintained that this superbeam could never work due to the properties of lasers—theory says that rather than converging and combining their energy, the beams would just pass through one another. That was true—until now. A team of researchers at Lawrence Livermore National Laboratory (LLNL) have added a plasma—a charged mixture of ions and free electrons—to the concept and successfully combined several separate lasers into a superbeam. This work was recently published in Nature Physics, and is a next step in LLNL's 50-year history of leadership in laser research and development. While this superbeam isn't quite as "super" as the one depicted in science fiction, it stands as an important achievement—for the first time, nine of the National Ignition Facility's (NIF) 192 laser beams were combined to produce a directed pulse of light that was nearly four times the energy of any of the individual beams. Leveraging LLNL's expertise in optics research and development, the team used a Livermore-designed plasma optic to combine the beams and produce this first demonstration of its kind. In certain experimental configurations, targets can only be driven by a single beam. Each beam has a limit on the amount of energy it can deliver. By combining multiple beams into one, LLNL's plasma beam combiner can break through that limit and push these experiments into new physics regimes. Beams with high energy and fluence are expected to advance a range of applications including advanced X-ray sources and studies of the physics at extreme intensities. "In high-energy laser systems, which use conventional solid optics, the maximum fluence (energy density) is limited by the damage of the material," said Robert Kirkwood, the lead author on the paper and programmatic lead for the campaign. "Because a plasma is inherently such a high energy density material, you don't destroy it. It can handle extremely high optical intensities." "Beam combining has recently been done with solid-state lasers, but was limited by typical standard optics," added Scott Wilks, co-author and one of the campaign's designers. "Because of this plasma optic, we can put a huge amount of energy into a very small space and time—serious energy, in a well-collimated (focused) beam." Laser research and development is pushing into new regimes of power and energy, which are limited by conventional solid-state optics. However, using a plasma optic could appear counterintuitive. "Plasma is generally bad for lasers—it is the bane of our existence. The team has turned that on its head and is intentionally harnessing plasmas for a benefit," said Brent Blue, co-author and program manager for National Security Applications at NIF. Plasma generally creates instabilities when combined with intense laser beams. However, by controlling an instability that causes the transfer of energy when beams cross, the researchers were able to combine the energy from multiple beams into a single powerful beam. "We've known that plasma can deflect light and change the direction of energy flow, but it's been difficult to do it in a very precise way," Kirkwood said. "Here we've shown that we can control optical instabilities in plasma so that rather than randomly scattering energy, they put it where we want it and do so with good collimation and high intensity, producing a bright beam that can be delivered to another target. We can now control and predict what the plasma does, quite accurately." Transitioning to a new optics material with a much higher damage threshold than anything used before opens the door to higher intensities and energies. 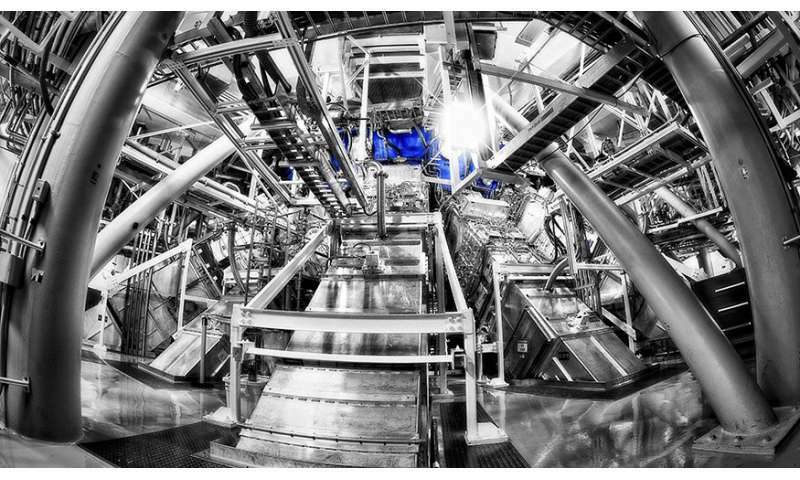 Looking forward, the team plans to scale up the experiment with the hope of combining up to 20 beams into one.